Sarcasm mode: engage! It's the time of the year every software developer loves... new operating system time! Only joking of course: operating system updates are an inevitability in the fast moving world of software, so it's a case of keeping on top of the latest changes. And I'm pleased to say that bliss is working well in Windows 10! Last week's release of Windows 10 was accompanied with much fanfare. The main goal of Windows 10 is to provide a unification across all devices, so while a user interface will inevitably look different on a phone compared to a desktop computer, it is easier for software developers to write software that behaves the same on all platforms. Furthermore, the user interface itself has gone through another re-design, righting what some see as the (many) wrongs of Windows 8.x. Pertinently to bliss, it's also worth mentioning a new browser, Edge, has been introduced, replacing Internet Explorer as Windows' default browser. But I'm not here to write a Windows press announcement. I'm here to report on whether bliss works on Windows 10. And I'm pleased to say it does! 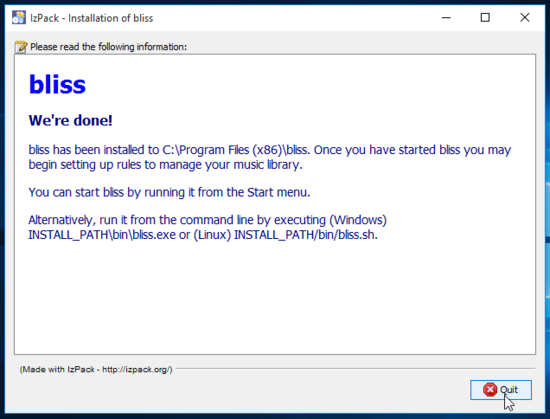 Installing bliss on Windows 10 works just as it did on previous versions of Windows. Download the latest version from http://www.blisshq.com/download.html and run the installer. The nice thing with Windows 10 is that the 'Desktop' has become the main metaphor once again, rather than the Metro interface. So as soon as bliss has been installed, you'll see the shortcut on the desktop. 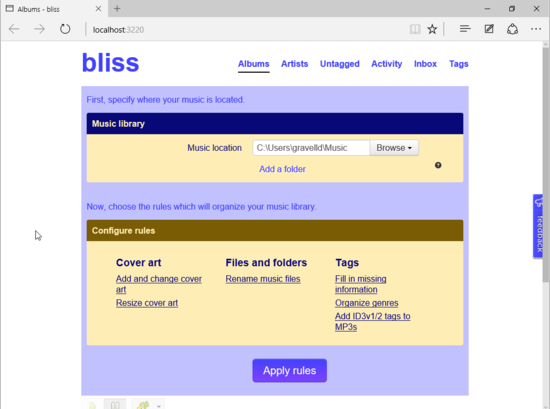 Here we see the main front page of bliss in its "first use" mode, i.e. prompting for the location of your music library. From here, bliss is just the same as previous versions, so it's a case of configuring where your music folder is and your rules. You may find these instructions on transferring settings to a different computer useful. Click on the licence link at the top of the page, in the middle. It says something like "123 fixes left". Scroll down the page and click "Re-enter an existing fixes code". Paste the code into the text box under "Install your code". You should see the fixes added to your account. Hopefully that's enough to show bliss up and running on Windows 10. My first impressions are with the new OS that it seems pretty slick. Enjoy!